The importance of ginger can't go unnoticed. Ginger is among the most famous and valuable spices across the world, and it is widely used to flavor foods. However, ginger is good for a variety of other uses. While in India the ginger root has been used for centuries in Ayurvedic medicine, in other parts of the world, it is a popular over-the-counter or home remedy to treat stomach issues, such as nausea and vomiting, as well as for alleviating the symptoms of common cold. Besides its well-renowned medicinal uses, ginger is currently used in the food, beverage, and cosmetics industries. Because of its peppery and slightly sweet flavor with an enticing, strong, spicy aroma, ginger is one of the most popular herbal condiments, believed to have been produced in Asia for more than 5,000 years. The fact that ginger is good in many different forms - pickled, preserved, crystalized, fresh, powdered, or ground - gives it an added element of versatility that has contributed to demand for it all around the world. Ginger's flavor and smell are considered essential in many Asian dishes, namely Indian and Chinese cuisine. When ginger is pickled in sweet vinegar, it turns pink. This Japanese preparation, called gari or sushoga, is most commonly served with sushi. Powdered or ground ginger lasts much longer than fresh ginger and is a common spice that has many culinary uses in curry, cakes, and cookies. In fact, ginger in its preserved form has been used in sweets since Medieval times. The gingerbread man, which is a popular Christmas snack, is credited to Queen Elizabeth I of England. Ginger can also be candied, a process in which raw ginger is cooked in syrup and then coated with granulated sugar. Extract of ginger is even used in ginger candies, which are consumed either for the taste or as an anti-emetic or anti-nausea agent. Fresh or dried, one of the most common ways of drinking ginger is as a tea, often mixing it with honey to disguise its pungency. Ginger tea is known to have soothing effects, calming an upset stomach or providing relief from migraine headaches. The use of ginger to flavor commercial beverages has been known for quite a while. Such is the case of ginger beer, which was first produced in England in the 1700s and soon became a popular export worldwide. Traditionally, it is made using fresh ginger root, lemon, sugar, and yeast. Currently, ginger beer is consumed on its own or as an ingredient in popular cocktails, such as the Moscow Mule. Another popular ginger use is as an ingredient for the famous ginger ale. Created in the 1850s, early ginger ale would not be recognizable as ginger ale today, as many manufacturers employed capsicum (from chili pepper) as a cheap ginger alternative. 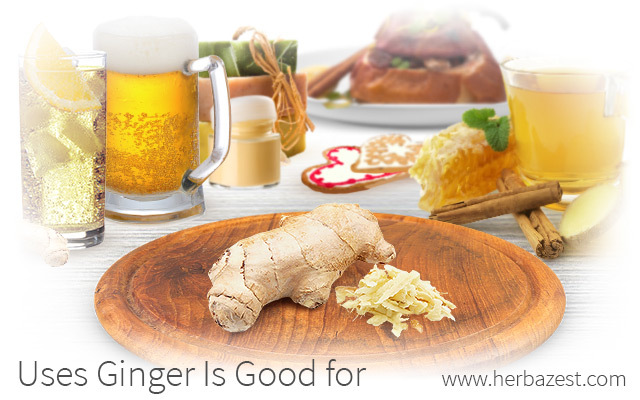 However, the traditional ginger ale is still often used as a cure for stomach upset and nausea, and it can even be mixed with lemon juice and served hot to soothe a sore throat. VERNORS GINGER ALE - CREATED BY A DETROIT PHARMACIST, JAMES VERNOR, IN 1866 - IS ONE OF THE OLDEST SOFT DRINKS IN THE U.S.
Because of its antioxidant, antiseptic, astringent, and vasodilator properties, the use of ginger's active ingredients is common in many skincare products, such as moisturizers, soaps, perfumes, body washes, face washes, bath salts, hair serums, lip balms, and much more. Ginger acts as a skin-conditioning agent - a moisturizer, sunblock, healing agent, and shining agent that can reduce freckles and acne. Although the medicinal uses of ginger are many and the herb is highly praised for its multiple health benefits, it is clear that ginger root is good for you in a myriad of forms. From food to beverage to cosmetics, ginger products are known to soothe common ailments, but are still a good way to access the nutritional and culinary advantages of this valuable herb.